We are talking about the most important ophthalmology event in Europe (and not only), where all the main stakeholders meet once a year. Specifically, this year we have been among the participants, both as organizer partner and as creative company for one of the most important player of the market. How do we make ourselves stand out? That’s the most important question a marketing office asks itself, especially when a company has to play along the rules of an international medical conference and at the same time has to manage dozens of courses and seminaries mediating between science and advertisement. It becomes even more difficult if that company is a multinational corporation leader in all ophthalmology sectors: how do we ensure a communication that can be at the same time effective, tailored on its needs, but also uniform and coherent? Our team contributed to the attaining of those goals, creating a replicable format customizable depending on the level of interactivity and attractiveness of each session, and able to transform itself adapting to the situation, be it a scientific symposium or a corporate course. It’s handy to have GDS as single point of contact, it helps our client having an open and continuous dialogue that gives us the opportunity to be also a reference and an actor in the creation of contents. This is where we talk about you and for you. The stage hosts your speakers and must represent your identity: lights and colours to identify the scientific area of pertinence, gobos to recall your brand and your logos. 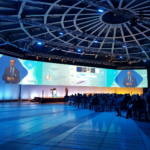 Special settings for the most attended events: a standard and aseptic congress room will be completely transformed turning into an identifiable and comfortable place. The power of virtual reality for the medical sector: comfortably placed in the booth, you will be listening to the KOL interviews, watching surgery videos, technical video animations and statistical data. The feeling you will have is that finally learning will be an almost entertaining activity. Are we still at the booth or are we on a journey? Keeping an open contact with the company teams and dealing with the EMEA referents, from Top Management to all Product Managers, we tried to give to each activity a neuromarketing side: videos are, for us, one of the most powerful tools. 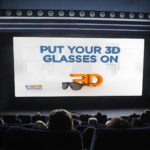 Intro movies, advertising videos, institutional emotional video, 3D videos, 3D animations. A fully digital stand. Enough with paper and printers, the booth has been conceived as interactive as it can be through the touchscreen interfaces for the monitors, where the users could browse independently looking for their contents of interest. A specific website for the event has guided the congress participants through the many activities of the company, promoting its visibility amidst the overwhelming program of the convention events. Alcon had an ambitious marketing project: to physically show the change on a professional level ensuring from the usage of its products. Realizing it was the task of the booth designer, but building the 3D contents for the cataract surgery section was a great teamwork job: together with the product managers we studied a questionnaire that, based on the users’ answers, would guide them through a personalized educational trail. Another benefit: all contents like this have a long life, and can be used and updated again and again granting the company a good payback for its investment. We elaborated most of the company’s communication following the graphic theme chosen by the company itself for its booth: printed material, presentation templates, posters. You may have noticed those big advertising spaces Alcon had at the Vienna congress centre.